Russia unveiled new arctic military equipment, including an armed snowmobile at its annual Victory Day parade on Wednesday. The new equipment was paraded through Moscow's Red Square as Russian President Vladimir Putin watched alongside guests, including Israeli Prime Minister Benjamin Netanyahu, Serbian President Alexander Vucic and American actor Steven Seagal. The TTM 190-40 snowmobiles are armed with a a 7.62mm PKP machine gun mounted on the back, making Russia the second country to have developed military sledges along with Canada's electric "stealth snowmobile." It can operate in temperatures as low as minus 58 degrees and can keep its two-man crew warm in an enclosed cabin. The snowmobile can travel 40 mph in a range of 300 miles. Also on display were the Uran-6 and Uran-9 unmanned combat vehicles and the BMPT-72 Terminator tank, the latter equipped with a variety of close-quarters and anti-tank weapons. Flying above the parade were MiG-31 fighter jets carrying Kinzhal air-launched hypersonic missile, which were debuted Wednesday. The Kinzhal missile is a modification of the Iskander-M ballistic missile designed to travel at supersonic speeds after being launched by a MiG-31. During his state of the union address in March, Putin mentioned Russia has developed supersonic nuclear weapons that are "invulnerable to enemy interception" and capable of reaching anywhere in the world. 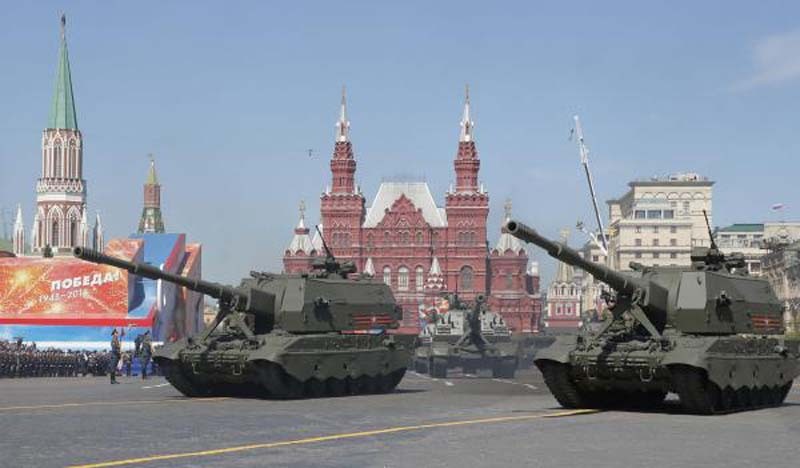 About 13,000 troops, including the first group of female personnel involved in the Victory Day festivities, 160 vehicles and 75 aircraft participated in the parade. Children from the defence ministry's Junarmia group also participated for the first time.